There is certainly no doubt that our children have great abilities and interests in new technology. My daughter is extremely interested in anything and everything I show her on our computer, laptops, or smart phones. She constantly asks to use my phone for apps and definitely prefers it over television. While I’m excited about her enthusiasm for new technology, sometimes I get overwhelmed by the amount of apps out there. I want to make sure we are using the technology as an educational resource and not just something to keep her fingers busy while she is sitting in long car rides. I am so excited to have recently discovered the Cypher Kids Augmented Reality Cards. The learning cards interact with Apple devices (iPhone, iPad, etc.) and provide so much more than just entertainment. 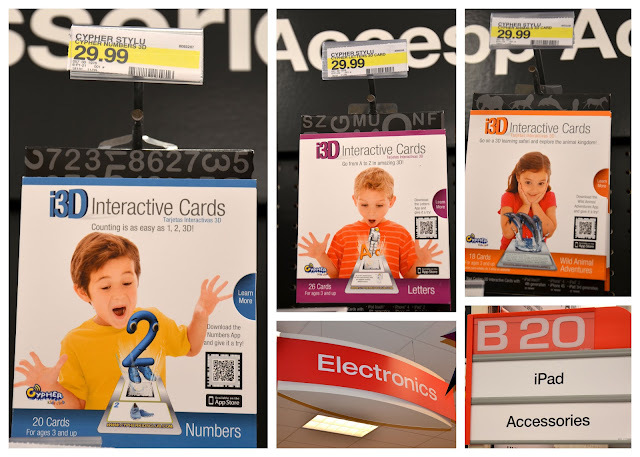 Last week we went to our local Target to purchase the cards. The cards were easy to find and I was happy to see they were fully stocked with all three card sets: Numbers, Letters, and Wild Animal Adventures. Initially I was not planning on purchasing all three sets of cards. My daughter is already comfortable with numbers and letters but after reading the information on the packages, I realized these cards are not your standard flash cards! They are very engaging and interactive. My daughter was very interested in the new cards we were purchasing. Before we even left Target she was already completely amazed by the Wild Animal Adventures cards. I quickly fell in love with these cards. My daughter did too. She used them every single day last week! One of the greatest features of the cards is they can be used with or with out the app. I was happy to see that good old fashioned flash cards were still great learning tools and held my daughter’s attention. The interactive app literally brings the figures on the cards to life. There are different apps for each set of cards. They are easy to find by searching the name of the card set. The other option to download the app is simply scanning the code on the front of the box with your Apple device. The background colors of the apps coordinate with the colors on the front of each card box. All three apps are free to download. Once the app is installed you can begin interacting with the card sets. Each learning card coordinates with a card selection on the app. You begin your adventure by selecting a card on the app and then finding the coordinating physical card. The flash card then gets flipped over so you can line up the scan code with the camera on your device. My three year old daughter quickly figured out how to match up the cards and scan the back all by herself. The figures on the cards then appear to jump right off the screen and come to life. Each Numbers card has a character that acts silly, counts, sings, and engages the user. My daughter was laughing and having so much fun! The Wild Animal Adventure cards were full of fun animals! My daughter is currently really interested in insects and reptiles. Her favorite in the animal cards was the iguana! She loved getting to touch the screen and making him jump out of the tree. By our second day with the cards, my daughter made it clear she preferred to use them by herself. I was completely comfortable allowing her to play with the cards on her own. Listening to her interact with the cards and hearing the lessons from the iPad was very similar to observing a preschool classroom. Although my daughter attends preschool daily and she is already learning numbers and letters, the reinforcement of the material and her eagerness to use the cards have made these a new favorite in our home. As I mentioned before, each set of cards are great with or with out the use of the app. Each of the Numbers cards (1 – 20) have the word spelled on the top in addition to big bright numbers. The back of the cards have counting objects. The Letters cards are the entire alphabet and each card has the uppercase and lowercase letter. Each letter is accompanied by something starting with that letter. The Wild Animal Adventure cards have wonderful real pictures of animals with their names written across the top. The backs of the cards have fun facts about the animals. I have countless family members and friends with children that would enjoy using the Cypher Kids Club Interactive Cards. I’m sure the cards will be making it onto my holiday shopping list. The cards are currently available for purchase at select Target stores and will be available during the Target Black Friday sales event. If you’d like to see more photos of my shopping experience with my daughter, take a look at myCypher Kids Augmented Reality Cards #CypherKidsClub #SocialFabric #Cbias Google+ Album. Have fun connecting with the Cypher Kids Club online, on Twitter, and on Facebook. Those cards look so fun! What an awesome idea. She looks like she is having a lot of fun with these cards!